Based mostly on luck, how to play roulette the right way is very easy to learn. The only real objective as a player is to predict (which is impossible) the ball's final resting place when the wheel stops spinning. Typical American Roulette wheels consist of 36 numbers plus zero and double-zero. Your wager on the roulette table can be placed on a single number, or be used to cover 2, 3, 4, 5, 6, 12, or up to 18 different numbers during one spin. 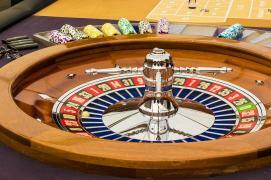 Here, we will teach you how to play Roulette and all the odds and bets which are available. If there is a choice, always choose to play European Roulette over American Roulette. If you are out to win, make safe bets. In theory, due to the fact that a Roulette Wheel is numbered 1 to 36, it should mean that each number has the possibility of showing up at least once every 36 times. If one particular number comes up then logically, it supposedly would not come up another 35 other times. Thus, the odds on any given number should be 35 to 1, which is directly equal to the payoff one would receive for getting one number. If you for example bet on red or black then you would supposedly get paid even money for a 50-50 shot, right? Actually, wrong. The issue with all that I've spoken about above is the fact that we haven't made allowances for the extra zero pocket in the European Roulette wheel and the zero and double zero pockets in the American Roulette wheel. It's these pockets which give the casino its house edge. It's thanks to these pockets that the odds of hitting a single number are actually 37 to 1, not 35 to 1. Wager on a single number, including zero (0) and double-zero (00). If the ball stops at your number, your bet pays 35 to 1. This is a wager on two adjacent numbers in the roulette table, which is placed on the line dividing the two numbers. If the ball stops at either number, your bet pays 17 to 1. Street bets cover three numbers. The chip is placed on the outer right boundary line of the roulette table, next to the corresponding row of three numbers. If either number hits, the street bet pays 11 to 1. Corner bets cover four numbers. The chip is placed on the cross where the four numbers intersect. If any of the four numbers hit, your corner bet pays 8 to 1. Covers the following numbers: 0, 00, 1, 2 and 3. The chip is placed on the outer right boundary line of the roulette table, between 00 and 3. If either number hits, your five bet pays 6 to 1. A line bet covers the six different numbers in two rows of three numbers. Ex. 4,5,6 plus 7,8,9. The chip is placed on outer right boundary line of the roulette table, where it is intersected by the line dividing the two rows. If any of the six numbers hit, your line bet pays 5 to 1. On the short side of the roulette table are three boxes marked "2 to 1." By placing your chip in one of these boxes, you mark all twelve numbers above it (0 and 00 excluded). If the ball stops at either of these numbers, your bet pays 2 to 1. A bet on a group of twelve numbers made by placing your chip in one of the three boxes marked "1st 12," "2nd 12," or "3rd 12." A winning dozen bet pays 2 to 1. A bet placed in one of the boxes on the left, long side of the table covers half of the roulette numbers. What is the safest bet that one can make when learning how to play Roulette? The safest bets that one can make is to bet on getting red or black, high or low or odd or even. That said, these kinds of best will also give the lowest payouts. Is there any instance when I should play American Roulette? If you're playing to win and not just for fun then you should probably avoid American Roulette like the plague. That extra double zero pocket has a lot to answer for when it comes to increasing the house edge. What's the worse possible bet I can make? We are about to let you in on a little secret; if you still decide to play American Roulette against our advice, never EVER place a bet on the 5 number combination 0-00-1-2-3 as it has the absolute worst odds and you can look forward to a 7.89% house edge. Roulette is a really fast game, how can I extend my gameplay? When it comes to how to play Roulette, the best way for one to extend their gameplay is by making sure that their bankroll is going to last. Therefore, if you bring $100 to the table, make 10 bets of $10 rather than two if $50. Learn how to play Roulette and win today! Even though learning how to play Roulette is relatively easy, that doesn't mean that you shouldn't put the work in. Here at GamblingPlanet we take our mission to teach people how to play Roulette very seriously which is why you can find more information about how to play Roulette and win on our Online Roulette page as well as on our Roulette Strategy page. Once you've gotten all our tips and tricks down, click on one of the specially chosen casinos in our toplist and prepare to win the big bucks.